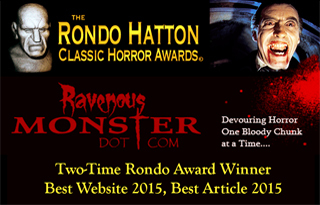 Horror, like a lot of pop culture, comes in waves with different splashes. First there were the German silent films that promoted an Expressionist chiaroscuro of dread, then came the Universal monster films of the 1930s, which combined German-style cinematography with American-born notions of perversity and evil. Of course there were other styles and influences at work during the 1920s and 1930s, but these are the big ones. These are the things that continue to inspire films even today, and furthermore these are the templates that kept horror barely breathing during two bad decades. In the 1940s, the war squeezed out and occupied horror’s traditional space at the cinema house, while in the 1950s the science fiction film was king. It really wasn’t until the 1970s when horror not only regained its earlier position in pop culture, but also underwent a fairly radical re-interpretation. By the 1970s, the earlier code against excessive gore and verbal aggression had fallen down along with the studio system, and horror directors gleefully exploited these new conditions. This then is one of the reasons why the slasher film dominated for so long, but was never better than its debut in the 1970s. Currently, horror is in the pits. Growing up in the ‘90s, I remember that every summer and fall movie season would bring at least a handful of new fright flicks. Very few of them were good, but at least they were available. Nowadays, it seems like one major studio horror film comes to town every six months or so, and even then it tends to stick to well-worn formulas. The only recent exception to this was Oculus, which some would call more of a mind-trip than a horror film. Granted, it’s the circular nature of Oculus that makes it frightening, almost as if the people in the film and the viewers themselves are trapped in a maze that they can’t get out of. Devil’s Mile is a similar film, but instead of constantly moving in a circle, this film is a straight line that leads to nowhere except back unto itself. I wouldn’t say we’ve entered a new era of philosophical and mathematical horror, but I’ve been wrong before. Written and directed by Joseph O’Brien, Devil’s Mile is a fast-paced film that doesn’t let the audience settle down. Devil’s Mile also doesn’t allow the audience enough time to ask any questions, for that might start the process of poking holes into the plot. Here’s what we know: a trio of criminals—Toby McTeague (played by David Hayter), Cally (played by Maria del Mar), and Jacinta (played by Casey Hudecki)—are driving two Japanese hostages (played by Amanda Joy Lim and Samantha Wan) to an arranged meet-up with the menacing mob boss, Mr. Arkadi (played by Frank Moore). Somewhere in the dark time before the film’s opening, the three criminals got lost and now find themselves on a rural road with no end. Although it may look straight, this demonic stretch of asphalt is really an ouroboros that eventually swallows everything up. It’s the road that’s evil, or at least that is how it seems on the surface. From the very opening, Devil’s Mile uncovers its mask to reveal an intentionally weird film. Everything contained within this eighty-minute movie is wrong, odd, or just plain abnormal. First there’s the communications truck which Toby’s hits, then there’s the truck’s driver, which Cally shoots because his injuries have turned him into a living zombie. After these unfortunate mishaps, one of the girls—Kanako—gets run over and mauled by the group’s Cadillac. Her bloody carcass at first stays down, then after a few jump scares, takes on the form of a wheezing demon that’s susceptible to light. It’s important to remember that almost none of this is explained in the film. For the most part, the characters talk amongst themselves about their histories, from witnessing a brutal execution orchestrated by Mr. Arkadi to Suki’s confession that her father is a fisherman and therefore unable to pay the probable ransom. But none of these moments can compare to Jacinta’s big reveal that her time in the slammer with Cally was pre-arraigned. Jacinta explains that she is some sort of law enforcement officer (department or acronyms are not given) out to get Mr. Arkadi. The only thing stopping her is the demonic road and its poorly designed demon. Some more about the latter: Devil’s Mile is most certainly an independent horror film, and as such its budget isn’t exactly sweeping. That said, barring the on-screen appearances of the demon and the shots that take place during the night from inside of the car, this film actually looks pretty damn good. On top of that, O’Brien and Cinematographer Brian Chambers show in Devil’s Mile that they are unafraid of extermination, and during certain scenes, a real artistic hand shines through in this otherwise dead-ahead horror film. Now for the bad news. Devil’s Mile clearly uses green screen technology, but didn’t do a great job of masking it. During the scenes when Cally and Jacinta trade lines back and forth inside of the Cadillac, the blackness outside of the windows is blotchy and shows signs of cuts and edits. At certain points I was waiting for something to float past the windows, but then I just realized that the white spots popping up were indications of a poorly hidden green screen. Compared to the film’s demon though, this first complaint is merely a speck dirt next to a latrine. After her vehicular murder, Kanako comes back as an asymmetrical monstrosity that warns the remaining survivors that the road won’t let them leave. These scenes are supposed to be frightening, but because of shoddy execution, they are hilarious. This does not sink the film, but it does hamper its potential for being truly disturbing. Some fear is saved by the film’s inexplicable conclusion, but ultimately it’s hard to get past the devil in Devil’s Mile. In the wake of Hollywood’s betrayal of good horror films, indie flicks have to step up and fill the void. There’s nothing wrong with this, and in fact it’s ultimately better for horror. Interesting ideas always bubble up from the underground, and hopefully indie horror will hit on something decade-defining sooner rather than later. Devil’s Mile is like a lot of indie films trying to keep the dastardly flame alive, and in that way it performs a valued service. Devil’s Mile is also a commendable film on its own merits, and besides a few botches, it ends up being an intellectually engaging scare. Now, about that demon again…. 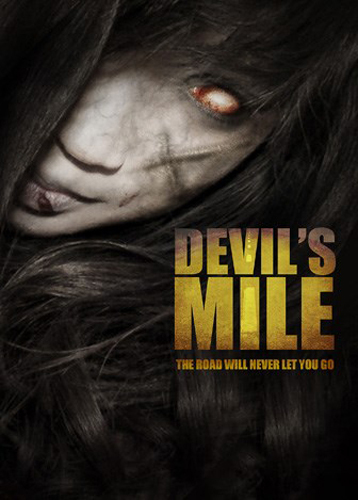 Devil’s Mile will be released in August by Grovers Mill Productions.